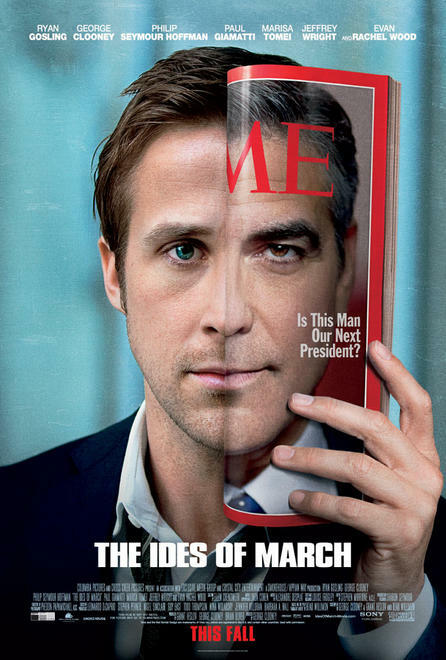 George Clooney went back behind the camera for "The Ides of March" film a political thriller in which he plays a presidential candidate whose campaign is imperiled by the hubris of a young media consultant played by Ryan Gosling. The trailer and poster have arrived and we're as excited about this one as ever. The trailer finds Gosling playing both ends against the middle, as Paul Giamatti tries to recruit him away from Clooney's campaign. Also in play are Marisa Tomei, Evan Rachel Wood and Phillip Seymour Hoffman. Watching this, you can see why it was chosen to open the Venice Film Fest--it's looks seriously commercial, while maintaining an art-house appeal. And this poster is among the year's best, with its eerie combination of the faces of Clooney and Goslin. "Ides of March" opens Oct. 7.